Successfully Added ZoomX - 16MP Digital Camera and 1080P Camcorder with 21x Optical Zoom and 3 Inch LCD to your Shopping Cart. Bring your world closer for everyone to see with the powerful ZoomX digital camera. With its 21X optical zoom lens, 16MP sensor, and a fast click-to-capture speed, it's time to zoom in on a high powered camera at an easy to handle price. 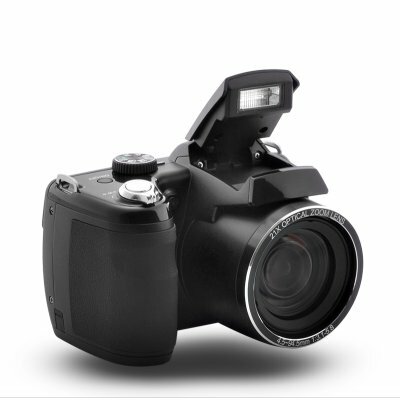 The ZoomX digital camera makes it easy take stunning images in an instant from any distance. The powerful zoom lens, with a 25-525mm range equivalent, closes the distance between you and your subjects instantly and clearly. Capture your son firing off the game-winning basket or your daughter's first ride on a two wheeler. Also whether it's a calm photo of the entire family inside, or a video of your children playing outside, you'll shoot effortlessly and accurately with the ZoomX. But the ZoomX digital camera is more than just about taking great photos and superb HD movies. If you're new to photography, this digital camera has intelligent features to help you out including image stabilization (which uses sensor shift to minimize the effects of camera shake and virtually eliminating blurred images), HDR, flash, continuous shooting, and much more. The ZoomX even provides high ISO speeds up to 6400 to capture fast moving or low-light scenarios. Finally, there's a dazzling three-inch color display that brings your stills and HD movies to life, showing you exactly what you're aiming at. Let the powerful and easy-to-use ZoomX Digital Camera and bring out the budding photographer in you. At this low wholesale price, you can't go wrong. Available in our warehouse now, order today and we'll express ship it out tomorrow. Auto: 1 - 1/2,000 sec. Manual: 15 - 1/2,000 sec. Night: 15 - 1/2,000 sec. I just purchased this camera online after much research. I'll let you know if it's as good as billed -- for that great price -- once i get it. I simply can't believe we have the zoom capability, the quality aperture, the 1080p video, the 16 MPs, and all the other great features for that low price. I am starting a human-interest story business after nearly two decades in professional writing and editing. I want little overhead in this economy, but I could not find everything I needed in a camera for less than $600 -- until I found this one for a third of the price. I will be extremely thrilled if it does its job well and will be very happy to sign its praises here online. on 2012-04-16 12:33:36 Excellent camera for the price. This camera has some awesome features and produces excellent picture and video. It does everything listed above and more. This camera will take pics on its own when it recognises smiles and will warn when someone has blinked. It is fantastic for the price. Only negative is the video sound is cut when zooming in or out and you can hear the motor for the zoom lens operating. All in all this is an excellent product for beginners or experienced photographers, takes great pics and video quality is superb.